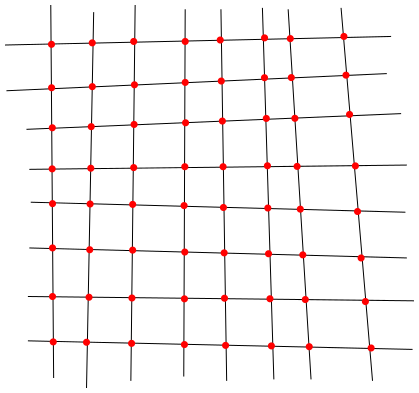 Today, I started thinking about the complexity of a certain geometric problem: finding the horizon of a set of convex objects. In this post, I'll first state the problem and then attempt to explain why this is an interesting problem to think about. Given a list of 2D convex objects, return a function h that maps each x-coordinate to the maximum y-coordinate such that (x, h(x)) is contained in some object. This is the "horizon" or "skyline" of the objects. Any algorithm that computes such a horizon must spend time at least linear in the number of output points in the horizon line. So it's interesting to think about how many points this could be. Particularly, I find this intriguing because of two different (related) problems. The Box Horizon problem pretty clearly has output of size at most 4N (for N boxes). The argument goes something like: the horizon is a chain of line segments alternating between flat segments and vertical segments. The vertical segments correspond to the vertical edges of boxes, and each box edge appears at most once in the list. This means there are at most 2N vertical segments, which must (therefore) separate at most 2N horizontal segments. But this standard lines example doesn't have a clear translation to the trapezoid horizon setting! So that leaves an interesting puzzle: is there some other argument that can be used to demonstrate linear output complexity of trapezoid horizon? Or, failing that, what's a super-linear output complexity example for this setting? I plan to ponder this more over the next few days. If you have some ideas, feel free to get in touch.